Steeped in musical influence, racial dynamics, and culinary significance, the Ninth Ward has distinguished itself as one of New Orleans’ most influential communities, with an impact reaching far outside the confines of a single city. So why is its history so often overlooked? Unique, multi-generational interviews, extensively researched and carefully recorded, preserve the experiences of former and current residents and the rich history of the district. Each source honestly evaluates discrimination, neighbors, poverty, and faith, delivering heartfelt and often harrowing insight into what it means to be from the Ninth Ward. A New Orleans native, Caroline Gerdes is a freelance journalist who has been published in the Huffington Post, Bustle, and HelloGiggles. She has contributed as an oral historian to the NASA Academy and is a Women’s Media Center SheSource expert. 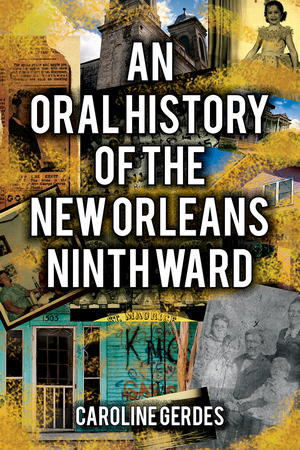 Gerdes received a grant from the National Geographic Society to preserve the history of the Ninth Ward through an oral history project, which she adapted into this book. Her husband served as her photographer for the project.